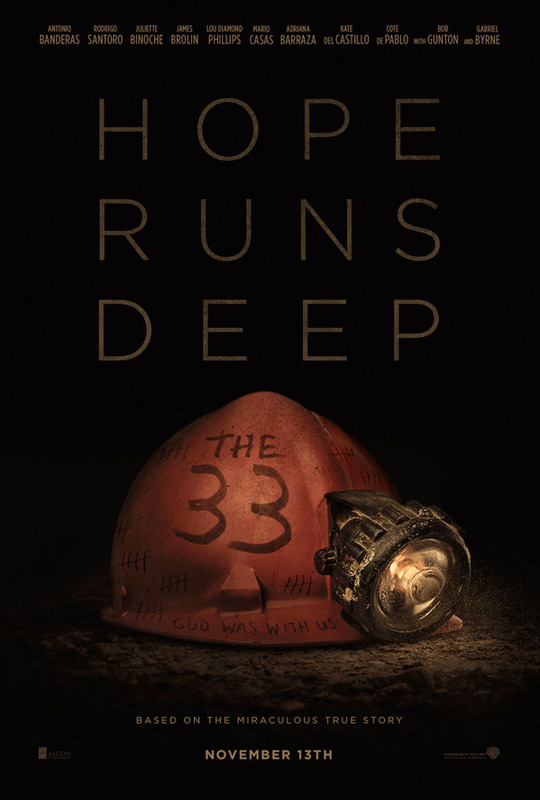 "That's not a rock, that's the heart of the mountain - she finally broke…" Warner Bros has debuted the full trailer for the Chilean mining catastrophe movie The 33, directed by Patricia Riggen, starring an ensemble international cast: Antonio Banderas, Rodrigo Santoro, Juliette Binoche, James Brolin, and Lou Diamond Phillips, with Bob Gunton and Gabriel Byrne. The cast also includes Mario Casas, Jacob Vargas, Juan Pablo Raba, Oscar Nuñez, Tenoch Huerta, Marco Treviño, Adriana Barraza, Kate Del Castillo, Cote de Pablo, Elizabeth De Razzo, Naomi Scott, Gustavo Angarita, and Alejandro Goic. This is one of those uplifting, inspirational movies of hope and perseverance. It's Hollywood-ized, but it still looks pretty good. All these people spoke Spanish in real life, not English.. So if you're gonna make a serious movie about this event, either do it in Spanish with subtitles or do it in English and get rid of the stupid accents !!! At least they are mostly all hispanic actors. That is EXACTLY what I was thinking. Why not make it in Spanish, shoot it that way, present it with subtitles. Maybe make a few scenes English, toss those in the trailer... Would feel much more authentic then this. But whatever, we're not the ones with millions to spend unfortunately. Sadly, and I mean sadly, there is a large percentage of the viewing audience that does not like to read subtitles. Therefore making this a Spanish language film would diminish the film's profits. Yes, I also would have liked to see the actors speak Spanish, but sometimes (all the time) money talks. I completely agree, they did it because of the target audience. I think that's what really bothers me about.. wish it wasn't that way, but it is. Anyway, good to see LDP back in action even with the stupid accent. Yeah... the English speaking Chilean miners is a little distracting... Sounds like it's going to be really formulaic ...I'll skip. I hoping this can act as a rebirth for Antonio Banderas.